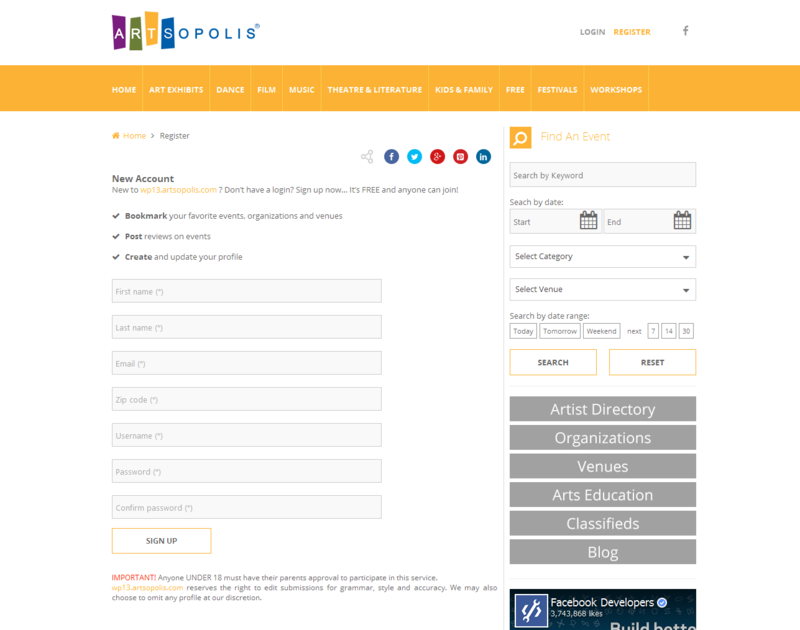 Welcome to the Artsopolis Users Guide. Here you will find help and documentation about the front end user's dashboard and how to manage your profile and events. Go to the homepage of the calendar site. Click "Register" at the top of the page to create your new user account. Please note: When creating your new account, please do NOT use an email address for your new username. Only lower case letters (a-z) and numbers are allowed; no spaces. Thank you! Once you have registered/created your account you will then be taken to a "success" page. From there you can click on the link provided or click "Login" in the top right corner of the page to access your new account. Once logged in you'll be on the main account dashboard. From there, you will have several options on the left column, including Events, Organization, and Venue. If you are an arts or cultural organization, then you should select "Organization" from the left navigation to add your profile to the Organization Directory. PLEASE NOTE: If your organization already exists on the site, please email the site administrator mentioned on the Login page so we can associate your new user account to the existing org profile. Multiple users may be associated with an organization. If you are an individual artist (visual, performing, literary, film, etc. ), you should select "Artist" from the left navigation to add your profile to the Artist Directory. PLEASE NOTE: This module may not be available on your site. If you also manage a venue where events take place, then you can also select "Venue" from the left navigation to add that profile to the Venue Directory. Organization – The Organization Profile form allows you to post your org description, address, contact info, web, blog, and social media links, plus tag your organization type. Venue – The Venue Profile form allows you to post your venue description, address, contact info, parking, public hours, admission, web, blog, and social media links, accessibility, plus tag your venue type. Artist – The Artist Profile form allows you to post your bio, web, blog, and social media links, plus tag your artistic discipline, style and mediums. Once you have completed and saved your profile form it will then be submitted to our administrative panel for review and approval. Once your profile has been approved by the site’s content management team it will show up to the public in the appropriate directory and search result pages. You can come back at any time to add/edit/remove information from your profile form by logging in and re-saving your changes. You will be prompted to upload a 'primary' image and also have the opportunity to add additional gallery images. All images MUST be at least 400 x 400 pixels in BOTH directions and .jpg, .png, or .jpeg format only. Each image should not exceed a file size of 1.46 megabyte (mb). Image file names must NOT contain spaces between words, question marks, exclamation points, apostrophes, quotation marks, or most other symbols (hyphens and underscore marks are OK). Our system automatically rejects images with bad file names. After uploading a primary image, you can now click on the Gallery tab and begin uploading additional images. These gallery images will display as thumbnails near the bottom of your organization profile page. 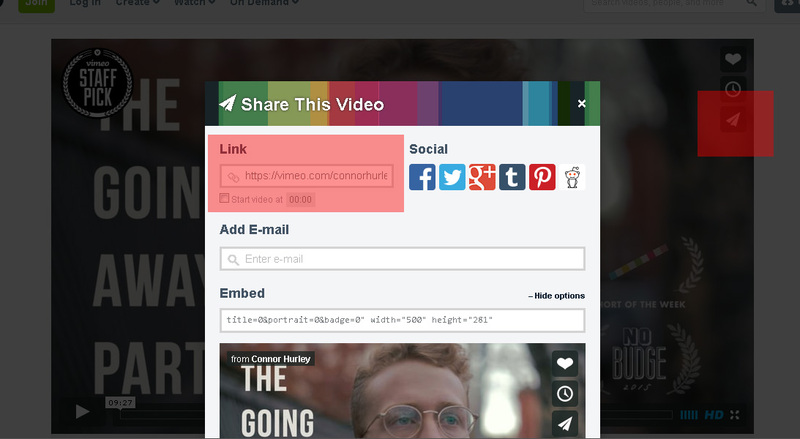 We accept the “share” links provided by YouTube and/or Vimeo. We do not accept any other video service links or embed code at this time. To add video to your profile simply copy and paste the share link provided by these services. See screenshot examples on the next page. To add audio to your profile we accept audio "embed" code from various services, including SoundCloud, Zing, CD Baby, and audio URLs with the ".mp3" file extension. See sample embed code on the next page. You can post an unlimited number of events to your account. Event postings should include at least one photo or graphic. You can also include additional gallery images and videos (YouTube or Vimeo). As with other listings, your submitted events will be reviewed. Once approved, they will be added to our website for public viewing. 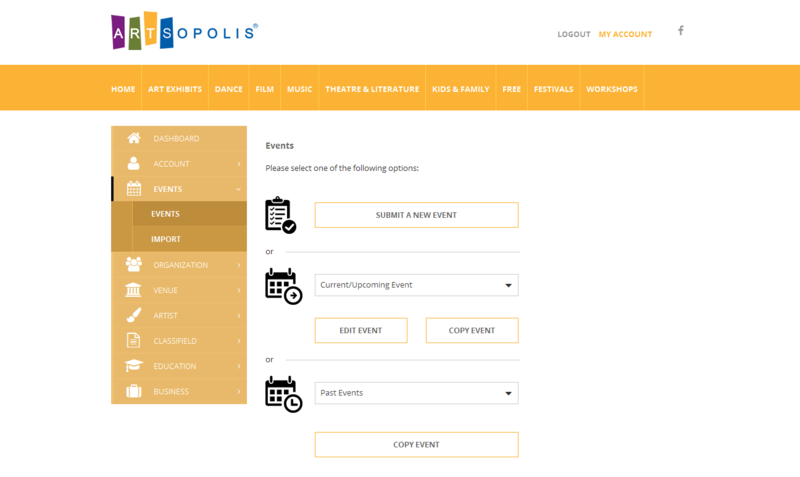 During the event submission process you can select the presenting organization and venue from drop menus that will save you time from having to re-enter that information each time you post a new event. You can also add “secondary” organizations if the event is being co-presented with another group. You will also be asked to provide the individual date and start time info for your event. This is a critical piece as this information is used both in our search function and our sharing of event listings with other community partners. Once posted, you can log back in to edit your listings if you need to add/edit/delete any information from the listing, including adding additional images and video. Please do not use ALL CAPS in your titles or listings – thank you! Also – a title is not the place for a description – keep your titles short and sweet! You can give more info in your description and add promo copy to the Summary field. 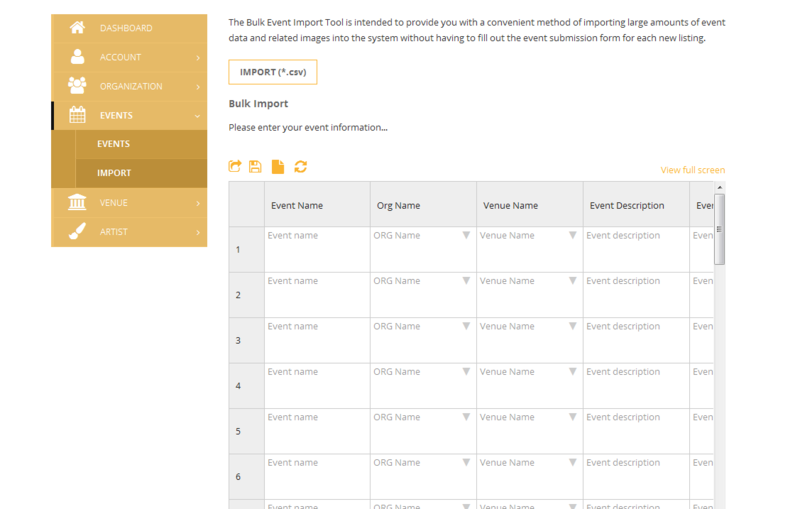 The Bulk Event Import Tool is intended to provide you with a convenient method of importing large amounts of event data and related images into the system without having to fill out the event submission form for each new listing. To access the Import tool, just log into user dashboard and go to Events > Import. Or, you can fill out the .csv template first and upload the file using the IMPORT(*.csv) button. This will place all of your information into the embedded form. Once the template is uploaded, you can edit any field(s) before importing your events. Please note, you can click the View Full Screen link to increase the visibility of the embedded form. The following is a list of data fields that are included in form. This list also indicates if the field is required or not. Event Name (required) - This field is the name of the event. Org Name (required) – use the drop menu to select the presenting organization for your event. Please note, your organization MUST be a registered org; temp orgs cannot be added. Venue Name – Use the drop menu to select the venue/location for your event. Please note, your venue MUST be a registered venue; temp venues cannot be added. Event Description (required) - This field is the event’s description and should have at least once sentence worth of text. 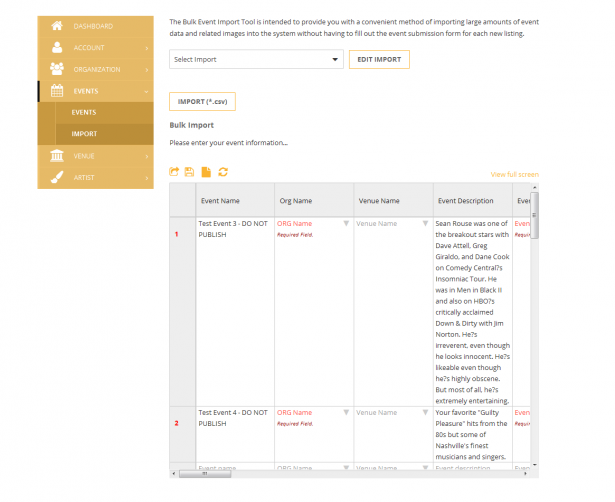 Event Category (required) - use the drop menu to select the primary category for your event. Event Subcategory - use the drop menu to select the sub-category for your event. Event URL - This field is the URL of the “official” website of the event. 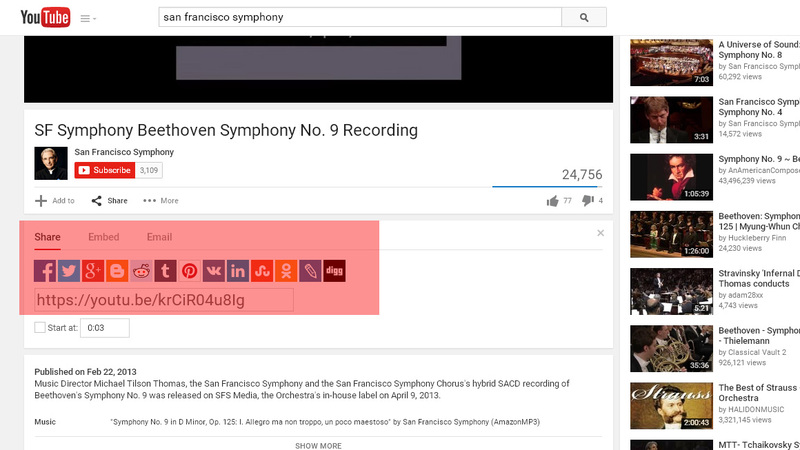 You must include http:// or https:// with the URL. Event Phone - This field is for the phone number to call for tickets or more information. Event Email - This field is the email address for ticket or more information. Admission - This field is for the ticket price and related information. Ticket URL - This field is the URL if tickets are sold with this event. You must include http:// or https:// with the URL. Start Date (required) - Use the drop menu calendar to select the start date for your event. End Date (required) - Use the drop menu calendar to select the end date for your event. Days of the Week – Enter the start time for each day of the week your event occurs. 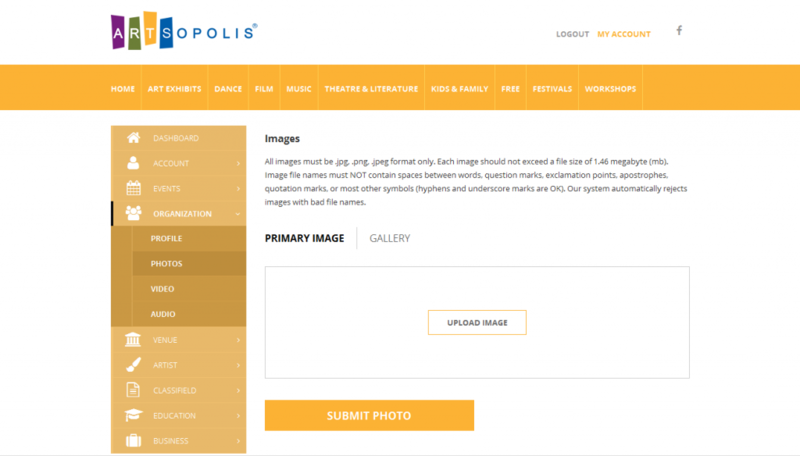 Image – Our form no longer requires you to upload a separate zipped image file or folder. Simply, enter the URL path where your event image is hosted. Contact Name (required) - This field is the name for whoever is submitting the data. Contact Phone - This field is the phone number for whoever is submitting the data. Contact Email - This field is the email address for whoever is submitting the data. 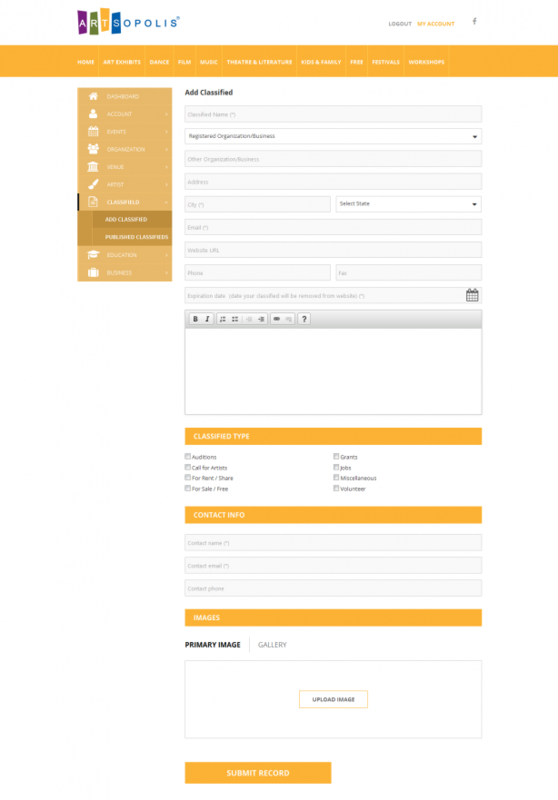 The embedded form has four buttons – import events, save for later, add new, and reset form. Once all your form fields are filled out, you can click on the Import Event button to upload your events or the Save for Later button to save your form and finish it at another time. The .csv spreadsheet layout is similar to the embedded form. Once you have filled in the fields, you can upload the information to the embedded for by using the Import CSV button. This will transfer the information from the the spreadsheet to the embedded form so you can make additional edits. For example, if you do not know the org ID number for the presenting org, leave it blank and when you upload the spreadsheet, you can select the presenting org from the drop menu on the embedded form. You can do the same for the Venue and Event Category. IMPORTANT! The order of the fields in your CSV file MUST match those indicated in the CSV template exactly. Please do not remove the first row of field names in the spreadsheet template. If they do not match exactly then you will receive an error during the upload process. There are some fields that are not required to have data; however, the overall field order and structure must be maintained to avoid errors. ALSO IMPORTANT! All content MUST be in "plain text." If you are pasting content from a MS Word document, you need to strip it of all its formatting by pasting the content into NotePad (an application generally found in your Accessories folder in the START menu) or similar application before pasting it into the CSV template. This will 'neutralize' the text and get it ready for a clean import. You many post opportunities within the cultural community to our Classifieds Directory that fit within the following categories: Auditions, Calls for Artists, Jobs, Items for Sale/Free or Rent/Share, and Volunteer opportunities. If your listing does not fit into one of these categories, we also offer a “Miscellaneous” category. Classified listings should be relevant to the “arts and cultural” community. Listings that promote opportunities and items available outside of “arts and culture” may not be accepted. For questions or comments, please contact the site administrator. 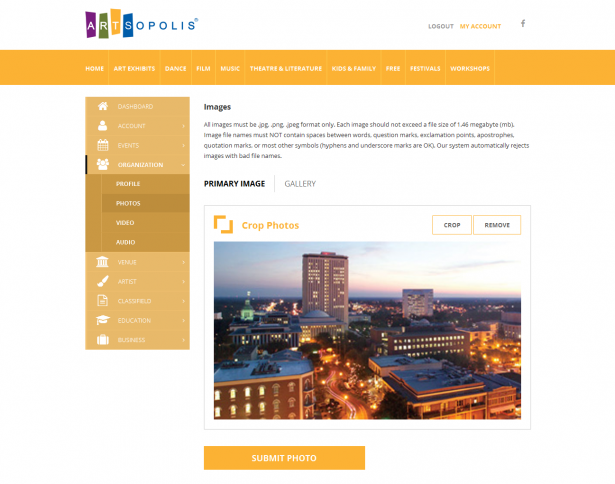 ARTSOPOLIS fosters arts and cultural engagement through related website development, hosting, maintenance, and consulting services.